Though its availability in the Canadian market may have lasted longer, the CP Rail F9-A finds itself in catalogs from 1971 through 1976. Dressed for Great Northern's Big Sky Blue scheme, the Bachmann GN F-9 is among the original six roadnames offered for this model in 1970. Following a practice Lionel enjoys, Bachmann numbered this ICG F9-A with the same number it used for the powered example's stock number. There were ICG F-units, but they were ex-GM&O F3-A's and not F9-A's. 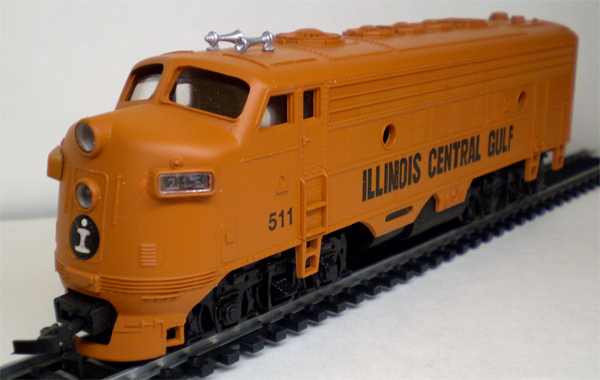 The three ICG F-units were not given the solid orange paint, they had the early '70s orange/white ICG scheme. The above pictured Pennsylvania Railroad example was among the initial roadnames for Bachmann's F9-A in 1970. The 1973 catalog is the final one to include a Pennsy F9-A. The 1974 catalog lists roadnames for the F9-A with only "Assortment." 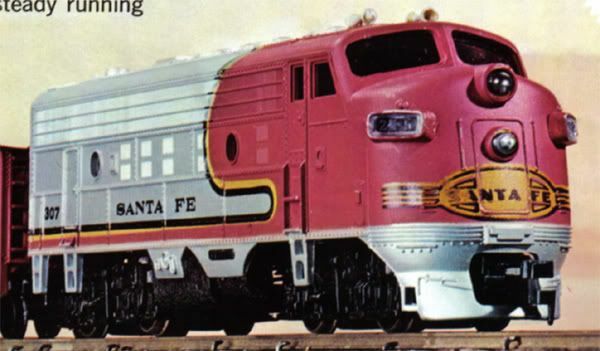 The Santa Fe red and silver warbonnet Bachmann F-9A is among the six roadnames for the introductory group in 1970. 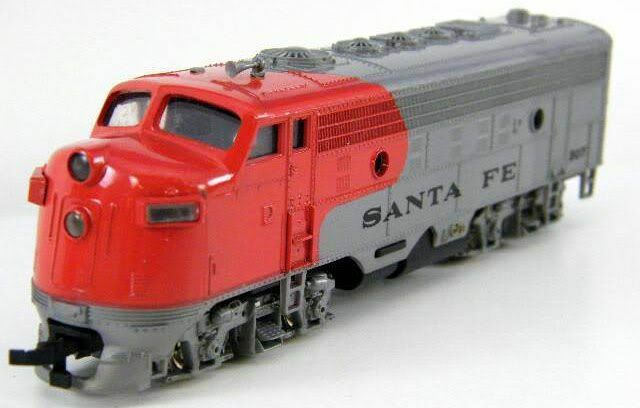 The 1970 Bachmann catalog features a Santa Fe F-9A both pulling a train set and among the individually available locos, but the examples used are N-scale models. 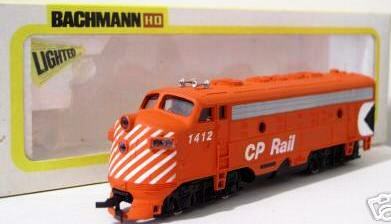 The 1971 Bachmann catalog displays an actual HO-scale Santa Fe F-9A and that image is found above. Also above is the Santa Fe model in an early '70s package, plus a shot of the underframe of the early all-wheel drive example. Additionally, you'll see a chrome plated single headlight example and the simplified warbonnet scheme applied for a time in the 1990s. 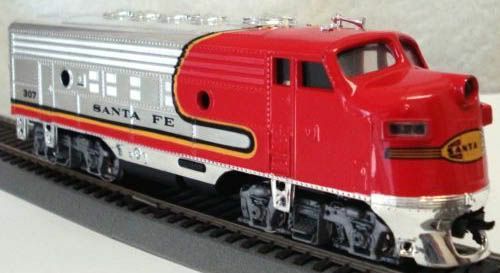 Carrying an $18 retail price and listed as, "a Bachmann Exclusive" was the freight warbonnet Santa Fe F9 in the 1975 catalog. Bachmann first catalogs orange and red Southern Pacific locos in the 1979 catalog. That year, we find a U36B and GP40 in what is suggestive of the experimental paint schemes that SP was trying out at the time. 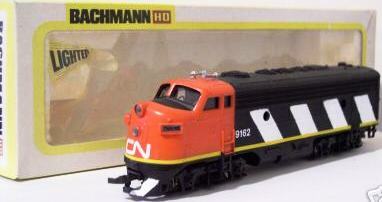 The Bachmann paint very closely resembles the TE70 units rebuilt from U25B's. 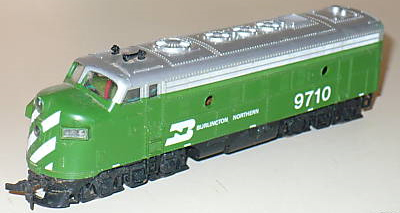 The F9-A did make it in the '79 catalog and was an '80s Bachmann issue. In addition to the three locos, Bachmann also produced the Wide Vision Caboose in orange and red Southern Pacific dress. 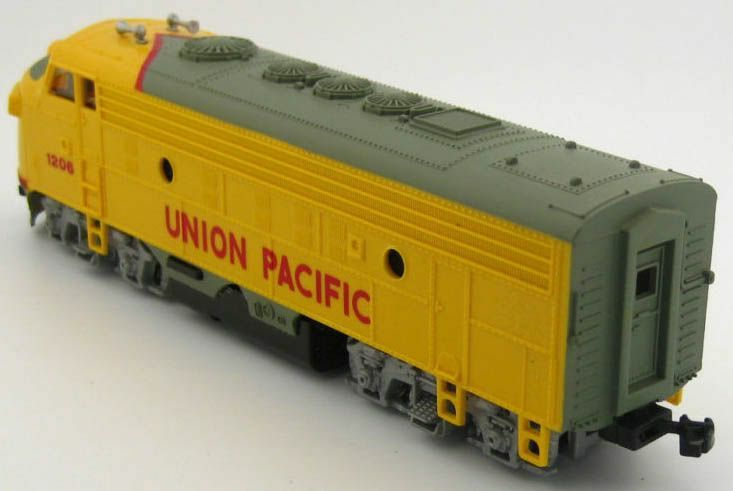 There are variations to Bachmann's Union Pacific F9-A offering. The model is among the early roadname offerings and is found in the 1970 catalog with the introduction of HO-Scale locos and rolling stock. The 1978 catalog is the first appearance for the example with the large UP shield located just behind the engine's cab. 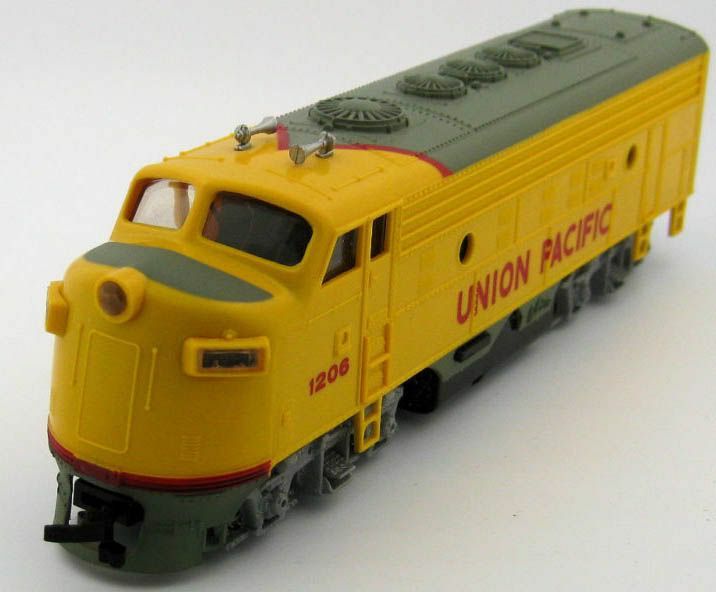 The simplified Union Pacific paint found on the late '80s example also features a simplified tooling for the F9-A shell. Note the removal of the lower headlight on the engine's nose and the absence of a steam generator on the rear roof section. 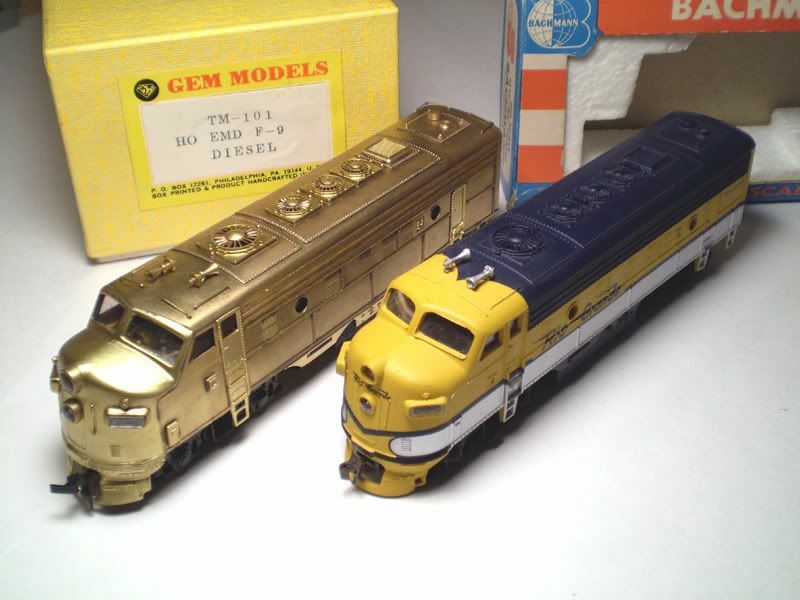 Above is a side-by-side comparison of the GEM F-9 and the Bachmann F-9. In addition to this similar looking F-unit, GEM also sold a GP40 that had more than a bit of resemblance to the original Bachmann example. GEM also at one time cataloged brass examples of the Metroliners. The GEM brass locos were sold with Bachmann drives as standard issue. 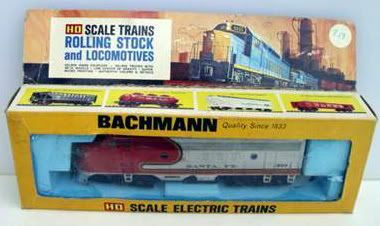 Also of note in the above image is the early original Bachmann packaging. 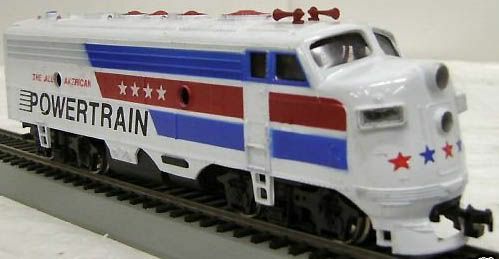 The red, white and blue boxes are what Bachmann's HO-scale model trains first arrived wearing.